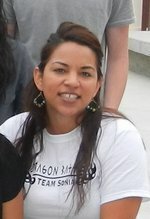 Hi, I'm Sonia Galvez and I am very happy to be teaching at Delta HS. Our students are smart, friendly, and full of energy. It is a pleasure to watch our students grow from the first day they arrive until the day they walk on stage at the graduation ceremony. When I'm not at Delta, I spend quality time with my husband and our dogs. We enjoy hiking, bike riding, and gardening.